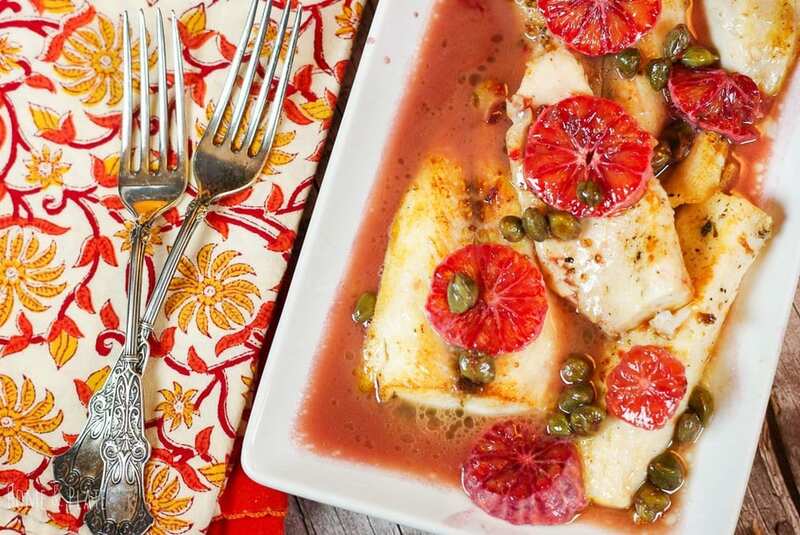 My blood orange cobia with capers is a flaky white fish that is enhanced by the flavors of fresh citrus and salty capers and ready in about 30 minutes. Have you ever heard of the fish Cobia? It’s a favorite of mine when I can find it fresh. 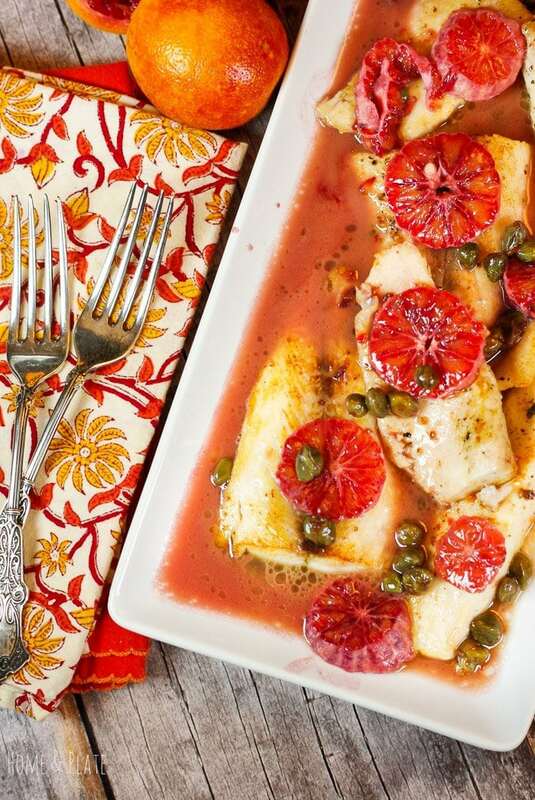 Delicious with citrus flavors, I’ve added a squeeze of blood orange juice and capers to this healthy dinner. Cobia is a white fish with a flaky texture and is typically low in oil and fat. It’s not fishy at all and can be cooked many different ways. It’s delicious when paired with fresh fruit salsa but also great with salt and pepper and just a squeeze of lemon. 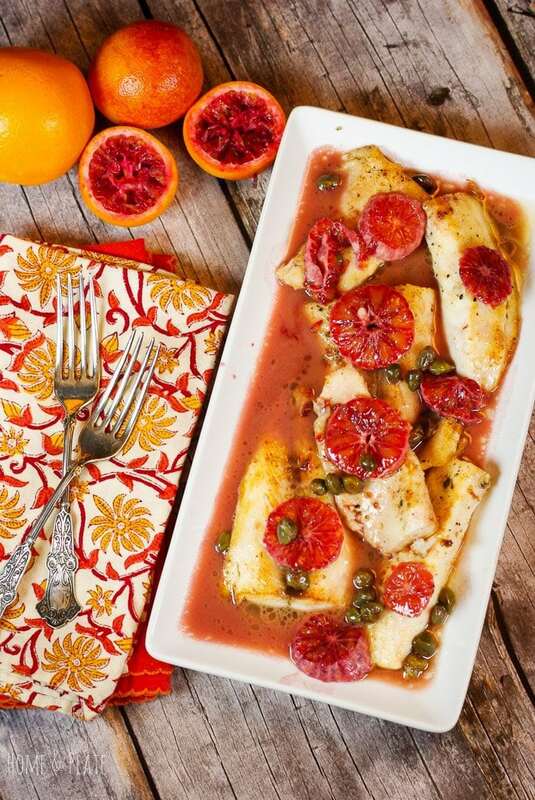 For this recipe I’ve created a pan sauce from freshly squeezed blood oranges and tangy capers. While the fish was pan seared cobia is also delicious grilled. And I prefer it grilled but with the temperatures dipping to 10°F it’s just not happening. Pan seared it is. Come on spring, where are you? If you have trouble finding Cobia, this recipe would also be delicious with grouper, mahi-mahi or halibut. 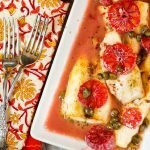 Be sure to check out my Baked Halibut with Artichokes and Tomatoes in a White Wine Sauce, which is a Pinterest favorite, and also my Grilled Grouper with Lemon & Herbs. Both delicious! I’ve been enjoying the sweet oranges and grapefruit that have been available and in season right now. They are the perfect ingredient to sweeten up any fish dish. 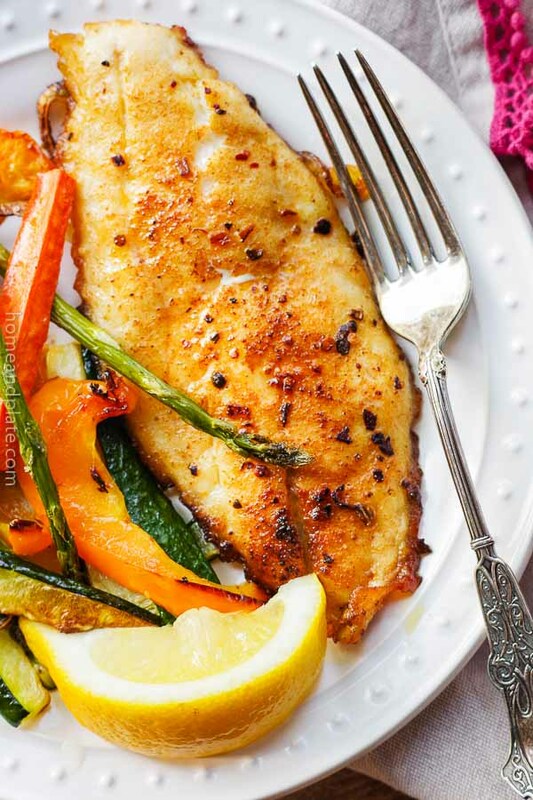 What is your favorite fish and are you eating the citrus that is is season right now? Season the fresh cobia with kosher salt and pepper. Heat the olive oil in a large skillet over high heat. Add the fresh cobia to the pan, reduce the heat to medium and sear the fish covered for 2 to 3 minutes each side. Once the fish has browned on both sides, is flaky and cooked through, transfer the fish to a plate and set aside. Remove the olive oil from the pan. Deglaze the pan with the red wine. Next, add the butter to the pan along with the blood orange juice, blood orange sections, capers and sugar. Allow the sauce to reduce for 3-5 minutes. Pour the sauce and oranges over the fish and serve. I have never heard of Cobia, but I’m intrigued and I’ll pretty much eat anything with blood oranges! Yes Cobia is popular in Florida but sometimes discovered in the cooler waters up the coast. I’m sure you’ll like it. It’s a great mild white fish. You should give it a try if you can find it fresh. 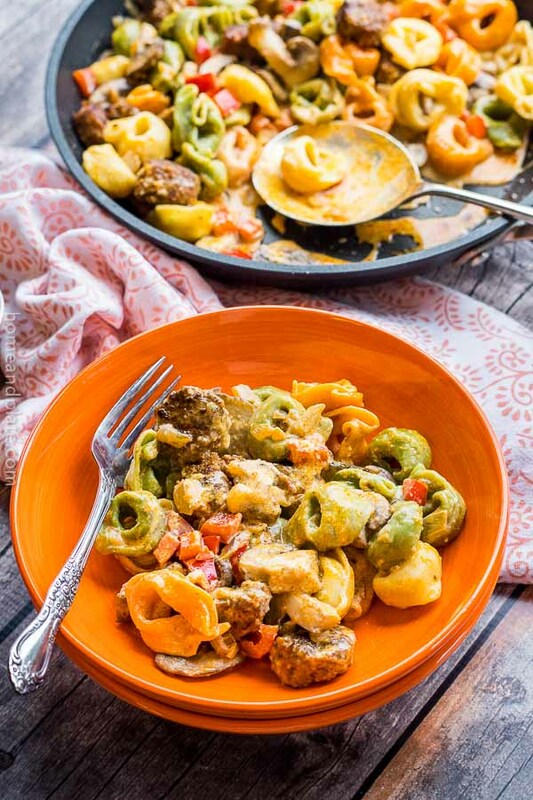 What great citrus flavors you developed in this recipe. Thanks Peter…I love the blood oranges in this recipe. I l-o-v-e blood oranges and this looks delicious!! Beautiful photos too! Do you think I could sub honey for the sugar? Absolutely…I think honey would be fantastic in this recipe. Sherri you would love it. If you can ever find it fresh, it’s delicious. The color in your photos is amazing. 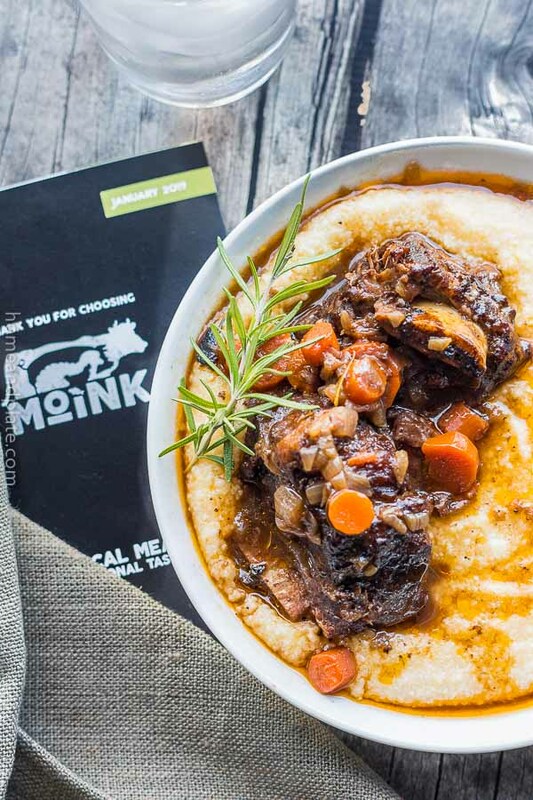 Your dish looks beautiful! Love it! This recipe sounds incredible! Love how fuss free and easy it is to make. Where does one find blood oranges? Thanks so much. I found bagged blood oranges with the other oranges at my local grocery store. The ones I purchased were small and almost looked like clementines.